Phra Athit road in the Banglamphu area is just four, five minutes of legwork away from the famous backpacker district of Khao San Road. 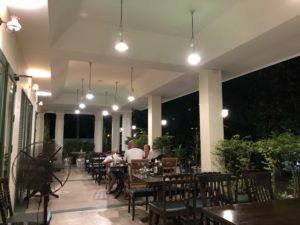 More importantly, you have genuine and good quality street food food to choose from as soon as you turn your back to Khao San Roads low quality Pad Thai stalls. If you still prefer to stay with the Khao San Road menu you’re best option for some quality proteins are the variation of fried bugs, that also goes well with the local beers. For those who want to dive into something more interesting and good quality street food, there are many options nearby the backpacker area. Kun Chiang is a find for a light ad delicious breakfast or lunch. Kun chiang have a menu with two or three dishes, and my favorite is a very good khao kluk kapi, meaning rice cooked with shrimp paste and served with a variety of toppings. Khao kluk kapi is a bit like the Lebanese mese or Spanish tapas, but here everything is served on one big plate. It’s up to you what tastes you would like to mix. The food at Kun Chinag doesn’t only taste very good, they also put an effort in presenting the food making it much more inviting than most street stalls around. The khao kluk kapi includes deep-fried Chinese sausage, deep-fried dried chilies (not spicy as you might think), long green beans and lime, a herb called cha om, slices of charlotte onion and a few pieces of fresh birds eye chilies, shredded green mango and peeled slices of cucumber, muu waan, ‘sweet pork’ or pork belly that has simmered in fish sauce and palm sugar, shredded omelet and dried shrimps that is deep fried to a crispy delight. And you get a bowl of soup on the side, a delicious pork stock. All ingredients are of good quality. I’m a big fan of mese, tapas or any other way different flavors are put on one or more plates to create a little symphony for your taste buds, with every ingredients playing a different part. The plate at Kun Chiang is very flavorful and with a variety of textures, and the ingredients are clearly separated for you to mix it the way you prefer. The stall is run by a welcoming couple, and the husband speaks English. It’s really interesting to see how few backpackers you find in this area, being so close to their party territory, and with such a good quality food just on their doorstep. For the rest of us, that is good news. But Kun Chiang with it’s good atmosphere really deserves their customers. The khao kluk kapi is always on the menu, but normally they also have a couple of other dishes to choose from. 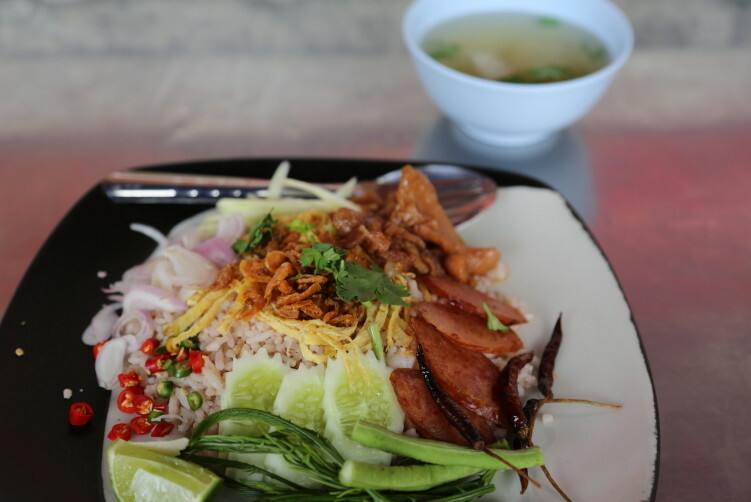 It can be the khao phat nam phrik long ruea, which is fried rice served with a pork and a chili-based dip that is tart as citrus is added, or the khanom jeen saw naam, meaning fresh rice noodles served with a coconut cream-based dressing. Or they have planned for something else that day. They seem to concentrate on dishes they make well, using good and fresh quality ingredients. One example is the fried Chinese sausage that is of excellent quality, and not anything like the rubber like consistence you find at many stalls and shophouses. Really some delicious pieces here. But of course, they also know how to cook. The stall is open during morning hours and lunch time and the dishes will set you back around 40 B. It’s only a hundred meters down the road from Phra Sumen Fort (on the other side of the road), across the street from Santichai Park withs is a lovely place to relax. The stall itself is on the doorstep to Escapade (burgers and shakes). How to get there: Taxi is the easiest way coming from down town Bangkok. You find it on the other side of the road of Fort Sumen, opposite Santichai Park. 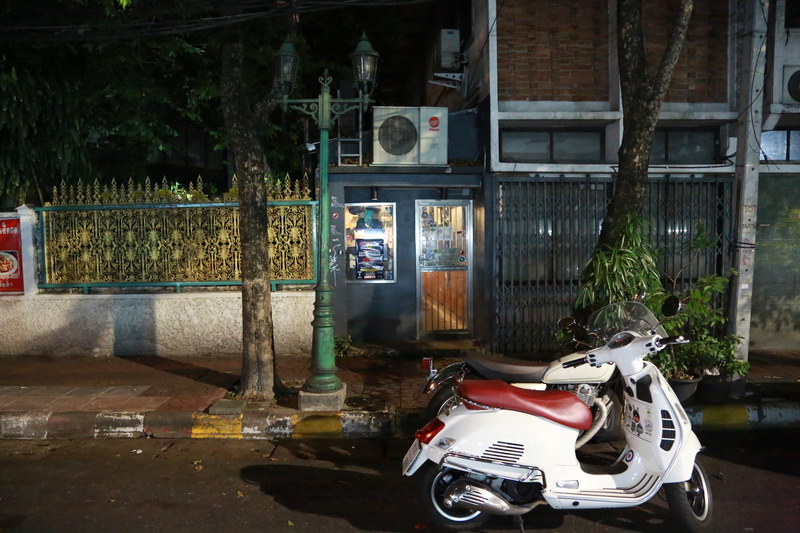 50 meters down the road from Roti Mutaba, a famous destination for foodies. See historic attractions just below the map. 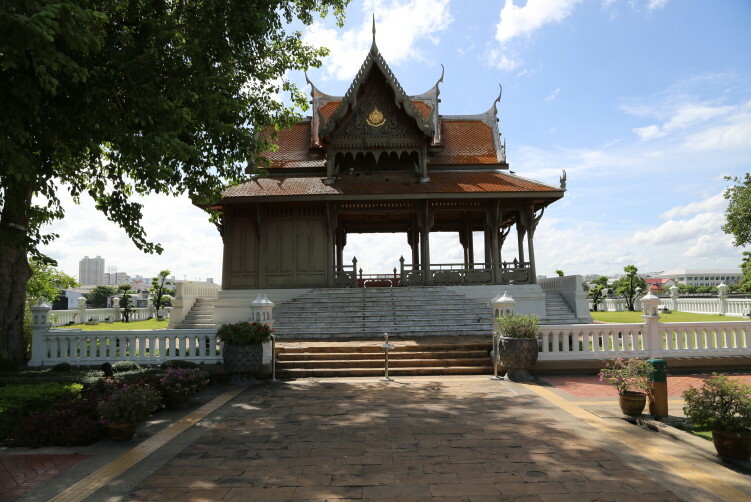 The first palace in Banglamphu belonged to Princess Chakjesda, sister of Rama I’s Crown Prince Phrarajwang Bavorn Sathan Mongkol. Today, only a small part of the wall has survived the modernization. It stands on Phra Sumen road, opposite to Phra Sumen Fort. 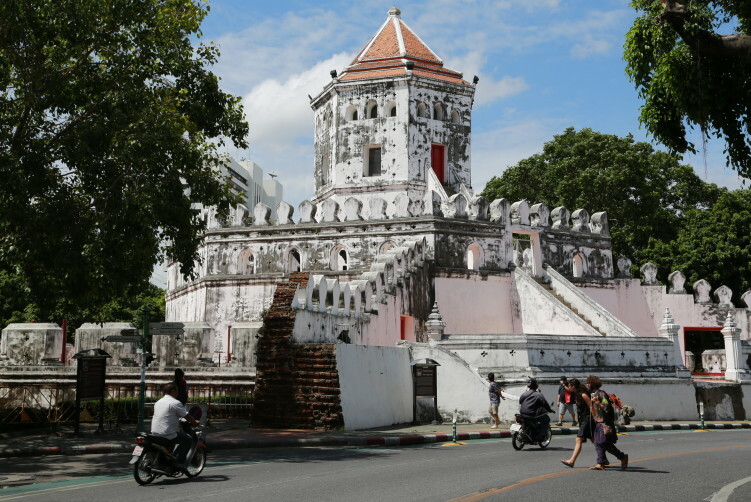 The Banglamphu area and the Phra Arthit Road is part of a history dating back more then 2 centuries, a time when Bangkok was selected to be the next capital of the Siamese Kingdom (Thailand). The fort was build in 1783 to defend agains any possible naval invasion. 14 of these octagonal brick-and-stucco watchtowers was built and punctuated the old city. Phra Sumen Fort, is apart from Mahakan Fort, the only one still standing. You can still find some old classic buildings in a colonial style in the area, and next to the Phra Sumen Fort, on the eastern side, is Wat Sangvej Printing School. This century-old building is also where they produced the early editions of textbooks in Thailand. Behind this building is the narrow canal called Bang Lamphu, a name from the trees that covered the area a couple of hundred years ago. The canal was dug by hands during the reign of King Rama I in the year 1782 and it took 10,000 Khmer laborers to complete it. This canal is also where Pridi Phanomyong, Thailand’s stateman, once cruised and distributed his leaflets that led to major political changes later on. The Lamphu tree had disappeared from the minds of local people until they found one in 1997. This tree is believed to be more than 100 years old. The Lamphu tree has vertical roots that grow towards the sky and is growing on swamp land. It’s also a tree which fireflies gathers on.